Paul is bitten by a snake, but he shakes it off, and no harm is done to him. N THE WOODED shore of the island where Paul's ship was stranded stood a group of excited men anxiously watching those who were escaping from the wrecked vessel near by. These men were natives of the island, and they felt sorry for the strangers who had suffered shipwreck. They hurried out to meet them and to help them reach the land. Then they built a fire, for it was still raining, and it was cold. Around this fire the drenched strangers gathered eagerly, for the sea had chilled them through. They were glad for the kindness these natives showed. And they learned from them the name of the island where they had landed. This island, called Melita, was south of Italy. As the strangers from the wrecked vessel stood warming round the fire, the natives saw that many of them were soldiers and prisoners. But they treated every one kindly. Paul wished to be helpful, so he gathered a bundle sticks to keep the fire burning. 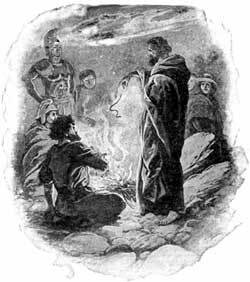 As he laid them on the fire the heat from the flames aroused to action a very poisonous snake which was hidden among the sticks. At once the snake sprang at Paul, seizing his hand with its deadly fangs. The natives knew Paul was a prisoner. When they saw the snake hanging from his hand they whispered to each other. "This must be a very wicked man, whom the gods will not allow to live even though he has escaped from the stormy sea." But while they waited, expecting to see Paul's arm swell with poison and then to see him drop over dead, they were surprised; for Paul shook off the snake, and no harm came to him. They looked in wonder, and then said, "This must be a god instead of a man, whom a deadly snake can not destroy." Not far from this place lived a man named Publius, who was the ruler of the Island. He, too, received the shipwrecked strangers kindly, and after Paul had not been harmed by the bite of the poisonous snake he invited Paul and his friends into his home. For three days he entertained them there. The father of Publius was lying very ill with fever and a disease which often causes death. When Paul heard of this he visited the man, and he prayed for him and healed him. The news of this healing quickly spread over the Island, and others who were suffering from diseases came to Paul, asking to be healed. In this way many people became interested in the prisoner who had escaped from the sea, and were happy because of him. And so it was that Paul published the good news of Jesus wherever he went, even though he was bound by a heavy chain. And everywhere he went those who received the good news were made happy. Now the islanders as well as those who had been with Paul on the ship saw that God's power was with this good man, and they respected him. For three months Paul and his companions stayed on this island; then when the spring days returned they took another ship and continued their journey to Rome.